India-China relations: A factor of stability or tension in Asia? The recent visit of the Xi Jinping to India symbolizes the beginning of a new stage in the development of the Eurasian space. The results of the visit of Chinese President Xi Jinping to India last week can be evaluated according to several criteria. Suffice it to say that by the end of his talks with the Indian Prime Minister Narendra Modi about 20 agreements were signed. However, the importance lies not in the number of signed documents, but the fact that Xi’s visit marks the beginning of a new stage in the development of the vast Eurasian space. 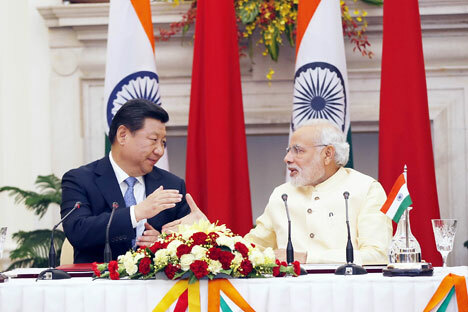 The agreements cover a variety of areas including investments into the road and port infrastructure of India, cooperation in space and in nuclear energy, construction of industrial parks in India, joint efforts in combating terrorism, cultural cooperation and a twin cities agreement between Mumbai and Shanghai. Most importantly, the leaders of China and India have sufficient time to carry out these tasks. Modi became prime minister just recently, and barring any extraordinary events, will remain in office at least until 2019. Xi Jinping became President of China in March of last year and, according to the accepted practice in the country, is likely to retain this position until 2023. However, there are a number of serious problems in relations between China and India, creating an atmosphere of mistrust. One of these is the still unresolved border disputes. Literally, on the eve of Xi Jinping’s arrival in India, Chinese troops, according to the Indian side, crossed the Line of Control in Kashmir and penetrated deep (500 metres) into Indian territory. And although the Indian side was not going make a big deal about this topic during the talks, Prime Minister Modi could not avoid mentioning the incident. Among the border problems, there is also the long-standing problem of Tibet. Back in 2003, India recognized China’s sovereignty over Tibet, but at that time China recognized Indian sovereignty over Sikkim only, not withdrawing its claim to Arunachal Pradesh, which Beijing refers to as Southern Tibet. Another set of problems is associated with the active penetration of China into the Indian Ocean and its increased influence in countries that neighbour India in this basin. In English-language publications, this Chinese strategy has been called the “string of pearls,” while in India, many believe that the goal of this strategy is the surrounding of India from the sea. Thus, this time as well, before coming to India, Xi Jinping visited two other countries in South Asia – Sri Lanka and the Maldives, being important links in this “string of pearls.” In Colombo and Male, Xi Jinping actively promoted the idea of a ​​“Maritime Silk Road” and found full understanding from the side of his partners. However, even more important is the geopolitical component of the Chinese president’s visit to India. Today, in a rapidly changing world order, an entirely new architecture is being formed in the global economy, politics and security. And on how relations develop between the two leading economies of Asia, not only determines the stability of the region, but also the direction of global politics for decades to come. Obviously, the events taking place in different corners of the world cannot be considered in isolation. It is hardly a coincidence that the BRICS countries needed to put forward the idea of ​​forming their own Development Bank, seeing that the United States had taken an aggressive stance towards countries forming the backbone of the BRICS. The creation of such a bank, and the transition to using national currencies in settlements between BRICS countries, in the coming decades could undermine dominance of the global financial system by the American dollar. It also strips power from the institutions established by the Bretton Woods Agreement. In relations with each of the three Eurasian countries that are also members of BRICS, the United States has chosen a variety of tactics. With regard to Russia, the Americans and their European allies are using overt pressure, in connection with the events they inspired in Ukraine. Towards China, the United States periodically addresses thinly disguised threats. Although the United States has not yet turned to the use of such pressure as they are placing on Russia, preferring the tactics of “indirect confrontation” (confrontation by proxy) – for example, by supporting countries that have territorial disputes with China. With respect to the India, the Americans are using a more subtle approach, trying in every possible way to placate this country and “attach” it to U.S. policy in Asia. However, the previous government of India has already been burned by the Americans, when under pressure from Washington, it joined in applying sanctions against Iran. Even today, the United States is actively trying (for now, unsuccessfully) to force India to support an American initiative to reform the WTO, which, if it should be implemented, would lead to the ruin of hundreds of millions of Indian farmers. All these actions of the U.S., for all their differences in external appearance, are essentially different tactics aimed at achieving one goal – the preservation of a unipolar world order. And this is not acceptable to India, or China, or Russia, or the BRICS as a whole. This is what is leading the Asian countries to undertake the creation of a new level of bilateral cooperation. Shortly before the arrival in Xi Jinping in India, a summit was held by the Shanghai Cooperation Organization, at which they removed the last obstacles to the entry of India and Pakistan into the SCO – as full-fledged members. This means that the major powers of Eurasia now have one more platform for co-operation and another pillar to create a power centre that is capable of opposing the unipolar world order.